Countryside seclusion and Georgian grandeur are at the top of many dream home wish lists – and Styche Hall emphatically delivers. Apartment 2, Styche Hall, Market Drayton, on the first floor of the hall, is a truly impressive property, with many original architectural features including high ceilings, elaborate moulded cornice, deep bay windows and beautiful moulded architraves. The three-bedroomed apartment is being sold online by SDL Auctions in partnership with agent James Du Pavey, with a starting price of £140,000. Deep in the heart of the Shropshire countryside, surrounded by open fields, Styche Hall was originally the home of Sir Robert Clive of India but is now a small community of luxurious apartments. Designed by Sir William Chambers and built 1762-1766, the three-storey building was altered in 1796-98 by Joseph Bromfield and again in about 1900. The apartment is entered through an L-shaped hall, with doors leading to all rooms, decorative coving and a large storage cupboard. 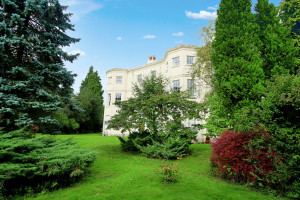 There are many standout features in the property, including a 20ft 11in by 19ft 3in lounge with impressive coving, dado and skirting boards and a huge bay window overlooking the magnificent communal gardens and countryside beyond. This room also has side-facing sash windows with wooden shutters, solid wood flooring, a fireplace with wood-burning stove and an original door dating back to the 1750s. For more formal occasions, the adjoining dining room provides a regal touch with its deep red walls. The two side-facing sash windows have internal wooden shutters, and there is a wall-mounted electric heater. A door leads from the dining room into the spacious farmhouse-style kitchen, which has solid wood work surfaces, a ceramic Belfast sink, base and wall units with a central matching island with breakfast bar. It includes a washing machine/tumble dryer, a dishwasher and extractor fan, with space for a Rangemaster cooker below. Character features include two side-facing sash windows and a wood-burning stove. There are three bedrooms in the property, all carpeted and neutrally decorated, and with high ceilings and sash windows. The master bedroom is large, bright and airy with ceiling coving and internal Georgian shutters. A feature of the second bedroom is a pine mezzanine floor which houses a double bed, taking advantage of the high ceilings to maximise the floor space below. A smaller mezzanine, suitable for a single bed, can be found in the third bedroom. The show home-style bathroom, with its wooden floor and tiled walls, has a four-piece suite, including bath with antique-style mixer tap and large double shower cubicle with electric shower. The sash window overlooks the garden. As well as the use of around nine acres of communal gardens and woodland, the property has its own designated garden area with lawn and shed. The apartment has one an allocated parking space, and visitor parking is available. Styche Hall is just four miles from Market Drayton, a market town with beautiful architecture and a good range of shops, supermarkets, restaurants, sports facilities and schools. The apartment is leasehold, with a 999-year lease granted in 1982. The monthly service charge is £262 and there is an annual ground rent of £1. A condition of the lease prevents the property from being let, so the property is only suitable for owner-occupiers. The property is being sold by conditional online auction by SDL Auctions in partnership with agent James Du Pavey, with a starting bid of £140,000, ending at noon on Friday 1 February.